A spate of terrorist attacks involving Palestinian Authority (PA) security personnel turning their firearms on Israelis is placing a strain on the discreet security cooperation place between the Israel Defense Forces (IDF) and the PA's armed forces in the West Bank. Guided by a common interest to repress Hamas and maintain stability, Israel's defense establishment and the PA's security forces cooperated on security affairs throughout a wave of largely unorganized Palestinian violence over the past year and a half. The PA's raids against Hamas and Islamic Jihad cells in the West Bank represent around 20 percent of all counter-terrorism raids there, according to official Israeli figures. Yet a series of shootings by armed PA personnel, targeting Israeli soldiers and civilians, is a warning signal that provides clues to the fragility of this cooperation. In the most recent attack, PA police officer Muhammad Turkaman, 25, fired his automatic weapon at a group of Israeli soldiers on Oct. 31, wounding three. He was shot and killed in the return fire at a checkpoint near Ramallah. Turkman was from the northern West Bank town of Kabatiya, which produced several terrorists recently. After the attack, the PA security forces spokesman Adnan Damiri denied that the shooting indicated a trend, and dismissed the idea that the PA security forces were becoming a threat to Israel, according to an Israel Radio report. Turkaman's attack was a response to a home search conducted by members of his own security organization, during which illegal firearms were seized, Damiri claimed. Security sources in Israel told the Investigative Project on Terrorism that since October 2015, five Palestinian Authority security personnel carried out terrorist attacks against Israel. Nevertheless, throughout recent years, security cooperation has continued. The sources declined to discuss the ultra-sensitive question of whether these incidents challenge future cooperation. The ability by Israel and the PA's 30,000-strong security forces to work together on the ground is a litmus test of regional stability. So far, the cooperation has weathered the challenges, but each new attack by a member of the PA security forces represents a new crack. . The ruling Fatah movement glorified Turkman's shooting on its official Facebook page, Palestinian Media Watch reported. Separate Facebook posts described Turkman as a "heroic martyr," and the "the Martyr police officer." Fatah claimed Turkman was a special forces member, and included photos of him posing with a Kalashnikov assault rifle. Away from such rhetoric, the cooperation quietly goes on. On Nov. 5, the PA foiled a bombing plotted against the IDF near Hebron, arresting a terrorist from the West Bank city of Kalkilya who planted a large explosive device. The PA alerted the IDF to the danger, which diffused the bomb. The PA periodically conducts such operations, often drawing fierce condemnation and outrage from its arch-rival, Hamas in Gaza. The big picture can appear contradictory; official PA ruling entities often promote and enable incitement to violence, while Palestinian security forces are under orders to continue cooperating with the IDF. That's because preventing Hamas and Islamic Jihad from taking over the West Bank is as much a PA interest as it is an Israeli one. And yet, the orders to cooperate with Israel have not prevented a growing number of Palestinian personnel from breaching their directives. The question of when – and if – these attacks might no longer be seen as rogue is critical. On Jan. 31, an armed PA employee fired on a group of IDF solders near Ramallah, wounding three, before being shot dead in return fire. In a statement following the attack, the Palestinian police force did not bother to condemn the shooting, announcing that "with great pride, the members of the Palestinian police eulogize the brave martyrdom of their colleague, Master Sergeant Amjad Sukkari... who committed the operation at V.I.P checkpoint in Beit El." Similarly, last December, a PA intelligence officer opened fire near Hizma, northeast of Jerusalem, wounding an IDF soldier and an Israeli Arab civilian. He was killed in return fire. 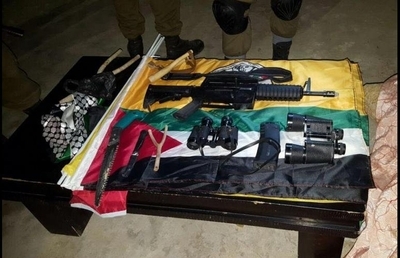 A month earlier, a PA security officer used a Kalashnikov to fire on an IDF patrol. The gunman was later turned over to PA custody by his father, and is serving a 10-year prison sentence in a Palestinian prison. In June 2015, a member of a terror cell that shot dead an Israeli civilian in the West Bank was a PA intelligence agency member. PA employees and police officers also carried out attacks during the Intifada that broke out in 2002, though on a much larger scale. During that period, they were acting under official policy set by then-PA President Yasser Arafat to pursue armed conflict and terrorism. Although Mahmoud Abbas is not known to have enacted similar policies, the PA continues to pay the families of dead terrorists and provide support for those imprisoned by Israel, records show. It is unclear whether that policy will apply to those PA employees carrying out the recent attacks. A big difference between the bloody days of the Second Intifada, which raged 15 years ago, and today is that the PA's armed forces and the IDF are, for the majority of the time, not shooting at one another. Instead they remain in communication and coordinate some of their activities. Only a complete halt of the succession of terror attacks by PA security personnel can rule out the return of a wider clash.